This is the first part of a two-part article on solutions to typical litter box issues. Can dogs and cats live together in harmony? Absolutely! There is, however, one recurrent problem that often occurs when you have indoor cats and dogs in the same household. Those of you who have both know where I’m going…yep, the notorious litter box…the one you can’t keep the dog out of. I mean really, what the heck are dogs thinking when they raid the cat’s litter box? Talk about bad behavior! Don’t know about the rest of you, but I found a solution to that litter box issue, along with another litter box solution that we will politely discuss in Part II of this series. Once I gave it some thought the solution for the first problem with the dogs was an easy one. The litter box (or boxes) just needed to go somewhere totally out of the dogs’ reach, but easily accessible to the cats. So here is what I did. I have a utility room closet with bifold doors. 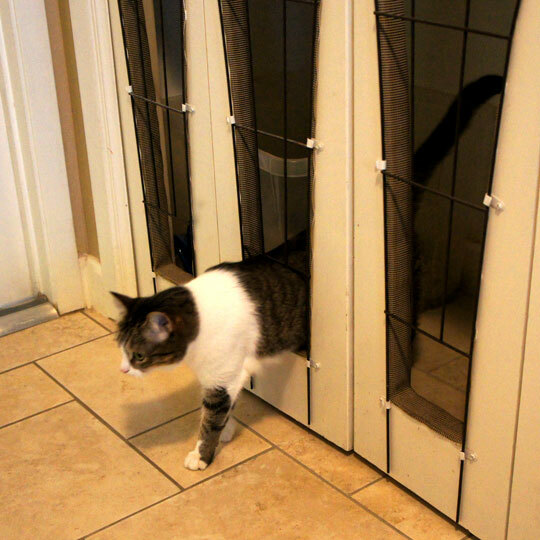 I altered the doors so the cats could go through a 5”x5” opening, which was too small for my dogs to squeeze through. Don’t guess this would work with tiny dogs like Chihuahuas, but it would prevent most small breed dogs from going through the opening. I also needed a way to let in light and air, so just cutting the opening would not be enough, because the closet would be too dark. Hhmmm. Time for a trip to walk the aisles of Home Depot and Lowes! I can always find inspiration there, and on a walk through the garden section of Lowes I found just what I needed – a wrought iron garden trellis! Or four of them, to be precise. I had already measured a door panel, to make certain I didn’t purchase something too wide, and had my ever-handy tape measure with me to check dimensions. The bottom section of the trellis had a perfect 5”x5” square opening, so that by installing a trellis on each door panel I could have four “openings” for the cats, depending on the final fit of the litter boxes into the closet. And I could cut the doors out following the pattern of the trellis, which would allow plenty of air and light. Once home, I removed the bifold doors and took them to the garage for cutting. I marked the location where I wanted the square opening on the trellis to fall, and laid my trellis as a template on the door panel. Once outlined, the cuts were fairly easy with a jigsaw. The only problem is that the doors were all hollow-core, and I had to cut through the interior thin wood bracing to make my open shapes. The integrity of the doors was ok, but now I had to find a way to cover my cuts. Another shopping trip, this time to Hancock Fabrics, gave me the solution. I purchased some very stiff fabric trim used in the upholstery trade, and stapled this just outside my cut edges on each side of the door panels. It worked beautifully! I then used some clips to hold the metal trellis shapes in place, and rehung the doors. Have you found any good solutions for keeping the dog away from the litter box, while still making it welcoming for cats? I’d love to hear them! This entry was posted in Home, Pets, Wordless Wednesday and tagged cat, Dog, home project, home remodel, Litter Box Solutions, Lowes, Pet Remodel. Bookmark the permalink. What a great idea, and it looks good too. Prudence is pretty determined, I’d be sure she’d just push her way through (& then get stuck)! Nice to meet you via the Blog hop! And then get stuck…LOL! Poor Prudence. Great to meet you too! 32 paws – Awesome!! Yeah, I have to admit I just love trying to figure out how to solve problems with unique designs. And I really do walk the aisles of home stores to do just that. Someday I’ll have to post photos of my wood garage doors we built with boxes of cedar planks that are used for closet interiors. Now that one turned out really nice! We love this idea! 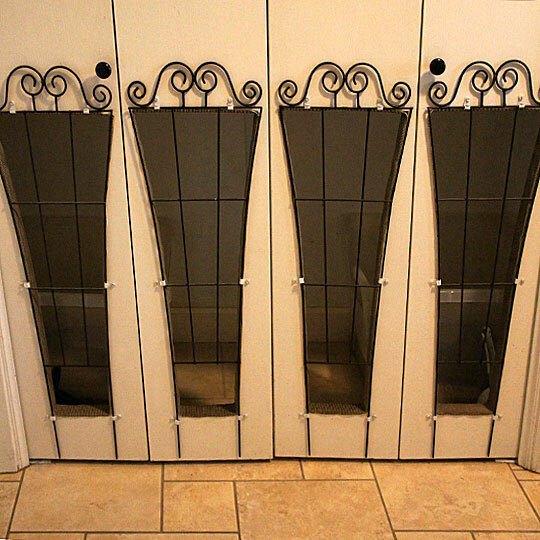 It looks so nice… If only I was sure Prudence wouldn’t force her way into the kitties lavatory, LOL! Wow – that is just beyond creative! It looks nice too! Ann, thanks so much! I really do love designing things, and sometimes when I’m working on a new project I just can’t sleep because I lay awake at night “designing” instead of sleeping. Crazy, I know. Wow, you sure are clever and very skilled!! My Mum’s solution is to not let me get a cat – doh! So not fair! Not getting a cat – that would work Snoopy!